Uniroyal Gal statues are the female versions of Muffler Men and were produced by the same company. In the late 1990s, before the history of these statues was known, RoadsideAmerica.com began calling them “Uniroyal Gals”. That is what they are commonly called today. These statues are 18 feet tall and weigh 230 pounds. In the 1960s, International Fiberglass made dozens of these statues for the Uniroyal Tire & Rubber Company. 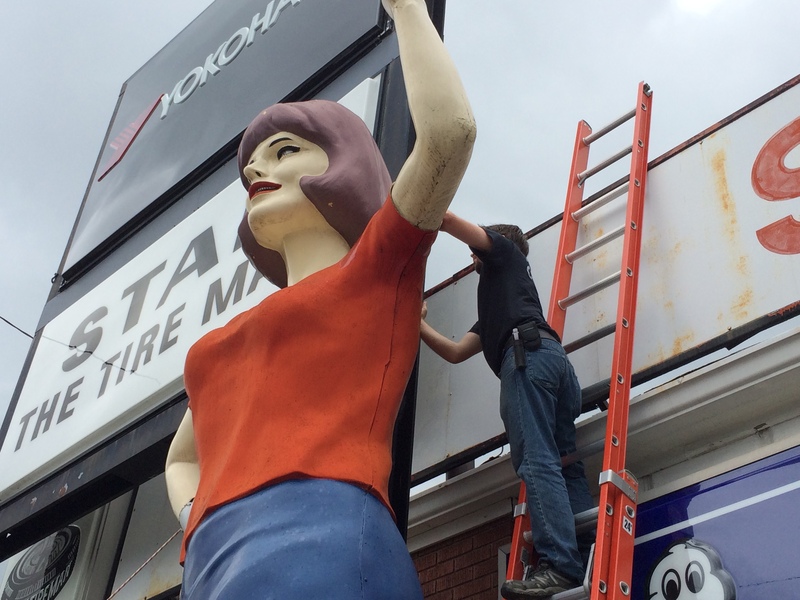 The “Miss Uniroyal” statue held a sign which read “Uniroyal Tire” in her upraised left hand. She wore a watch on her right wrist. Many people have conjectured that she was modeled after Jackie Kennedy, however, there is no evidence to support that. The statues came with a platform and trailer which made it easy to move them around to different gas stations. 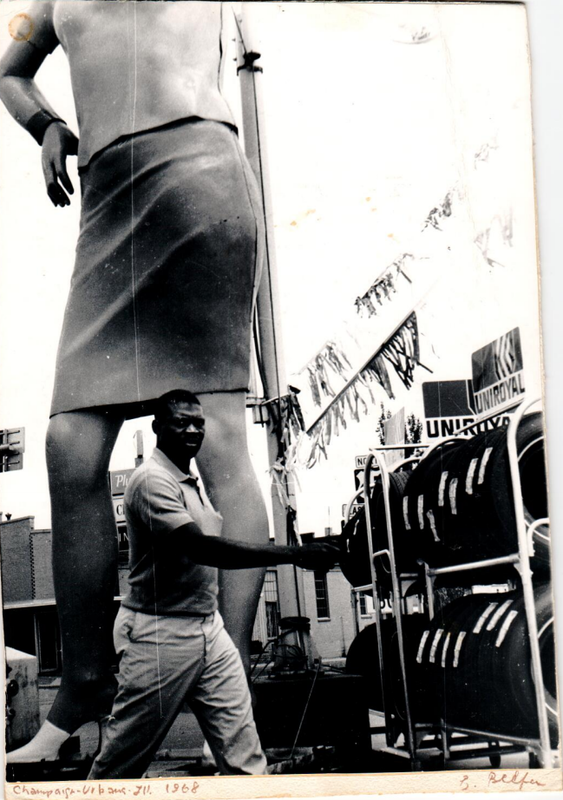 The Uniroyal promotion ended in the late 1960s and the statues were destroyed or sold to different businesses. International Fiberglass began marketing these statues with the new name of “Miss America”. In 1970, you could purchase one of these statues for $3,150. She came wearing a bikini but you could pay extra for the add-on skirt and blouse. Two of these statues have been in Illinois since the late 1960s. The one in Peoria is still there and was featured in our American Giants Episode 4 video. The other statue which was in Mount Vernon was removed this week. 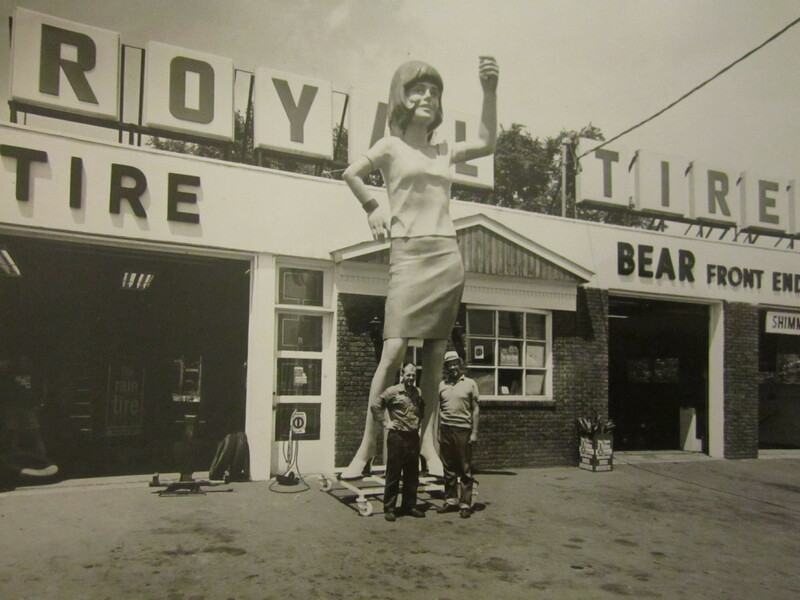 Around 1970, the Mount Vernon statue was purchased from a gas station and installed at Stan the Tire Man. Stan Koziara, the owner, and Dale Lowery installed the statue next to the shop’s Paul Bunyan Muffler Man. 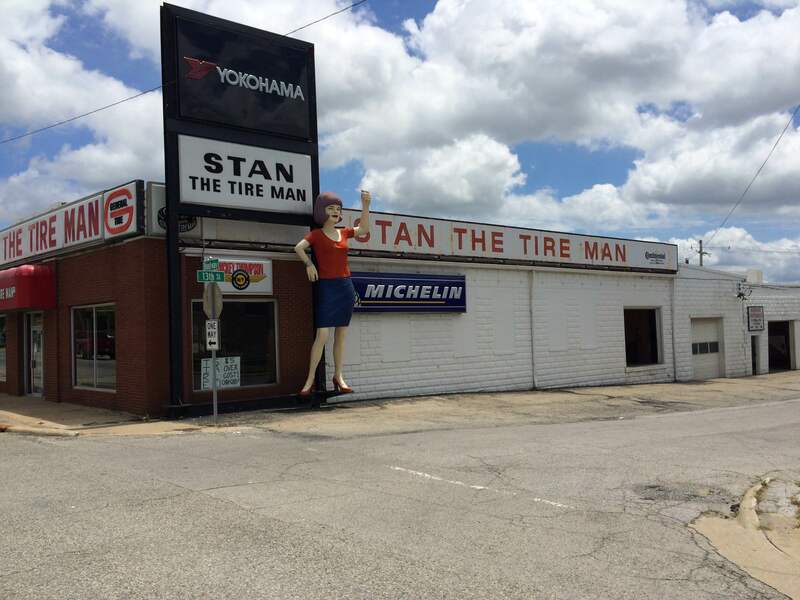 The Paul Bunyan statue was later moved to the Stan the Tire Man in Salem, Illinois. In 2007, it was moved to Rocky Mount, NC. I n the 1970s, the Mount Vernon Uniroyal Gal wore a white blouse and red skirt. Her trailer was kept nearby but it was stolen at some point. In April 2015, it was announced that the store would be closing on June 1. Many people contacted Stan about the statue and made offers. In the end, it was Bruce Kennedy of Bell Plastics in Hayward, California that bought her on June 15. We recently covered Bruce’s statues in American Giants Episode 11 video. His Muffler Man collection consists of two Paul Bunyans, a Half Wit, and a Cowboy. Bruce contacted me about his purchase of the Uniroyal Gal statue and asked if we could help take her down for shipment to California. This was something we hadn’t done before but we felt we knew what was involved. On the morning of June 19, we got to work. There were two support bars attached with bolts to her shoulders and four bolts on each foot. It took more than an hour to remove the rusted bolts. Then, we gently lowered her to the ground with a pulley system. The four of us then loaded her into the trailer. The people of Mount Vernon and Southern Illinois have lost a rare piece of 1960s roadside Americana. It is always sad when one of these statues that has been standing at one place for so many years is relocated. However, the silver lining is that this Uniroyal Gal will be well taken care of, and displayed where many people can still enjoy her and see her with the other Muffler Men. Bruce plans to restore her and we are looking forward to seeing her again. The Uniroyal Gal arrived in Hayward on September 2, 2015 and joined Bruce’s collection. 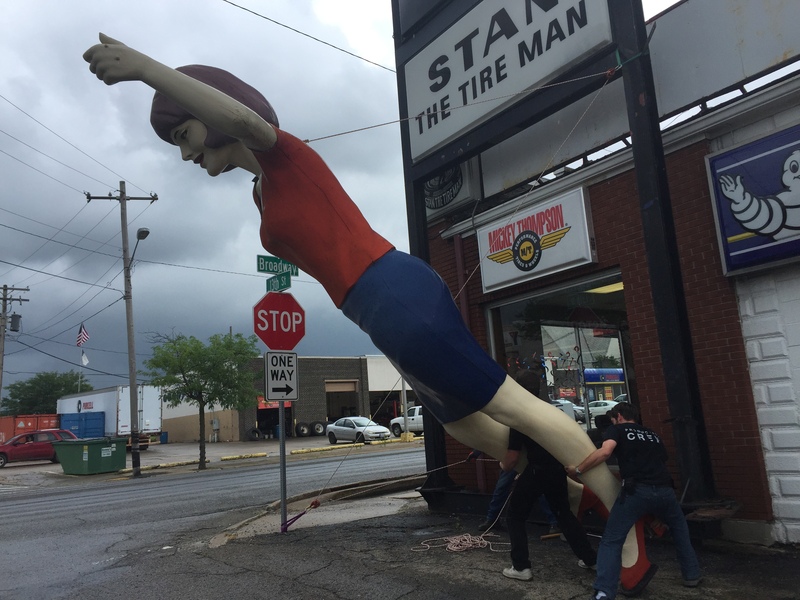 I want to thank Bruce Kennedy for his support of American Giants as well as the people at Stan the Tire Man who were very helpful and accommodating while we were up there taking her down. Also a big thank you to Debra Jane Seltzer for her help in editing this article and fact checking. mistake moving her out of MTV.